I love how they call to check in and make sure you arrived at your cabin. It was the perfect getaway. Hate to go home. What a beautiful cabin-well really spectacular! Touch of class! We will have many views of the mo0untains because it changes constantly. We will return to Shooting Star Ridge. I had to call your office several times to ask questions about the cabin. The staff was wonderful and answered every question. Just wanted to let y'all know that I did MANY hours of research online searching for the best cabin, and you had the best options! This is a "birthday trip" in celebration of my 30th birthday, so the "4 nights for the price of 3" special was a great, unexpected present. Thanks for offering what look to be very nice cabins, and a convenient process for reserving them! I am so excited about this trip! Breathtaking Views, immaculate and homey cabin, Shooting Star has it all. We drove 17 hours to bet here and have enjoyed every minute of our stay, so much that we changed our road trip plans to Texas to stay longer in the Smokey Mountains. Keep wishing upon a Shooting Star. Very knowledgeable about local attractions and things to do. Even emailed me info on local hikes. Everyone was extremely friendly and knowledgeable... every question was answered and every need was met. The description and pictures on your website were accurate, but they didn't do the cabin justice... it was nicer than I could've hoped for. Relatively short drive and it was an unbeatable value. The property management called the day that we checked in to make sure that we found the cabin and see if everything was to our liking. I really appreciate them taking the time to ensure that their guests were happy. The cabin was beautiful and exactly what we were wanting. It started snowing on us while we were in the hot tub....totally picturesque. We had a great time during our stay. We BBQ'd, got in the hot tub and relaxed on the porch. We loved the warm inviting feel of the cabin. We visited everywhere!! Bryson City, Smoky Mountain Railroad, Cherokee, Waynesville, Asheville, and Dillsboro. Our family will cherish the memories made together on this trip. This was one last trip before we became parents. Everything was wonderful. We were beyond impressed with Native Winds! We are so glad we chose this location for our honeymoon. We enjoyed every minute. 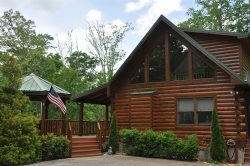 The cabin is cozy and beautiful and the location is perfect to enjoy all that the area has to offer. We love the Smoky Mountains and look forward to returning to Native Winds sometime soon. The Breed Family.